Use professionals consultants and specialists who have undertaken work of a similar nature to the project you wish to undertake. Undertaking a construction project should be an enjoyable experience, albeit one that can be an eye opener for the uninitiated or a well-trodden path for the experienced. Although there are many routes open to you in order to reach your desired goal there are basic fundamentals which must be considered before undertaking a project, whatever the value or scope. 2. 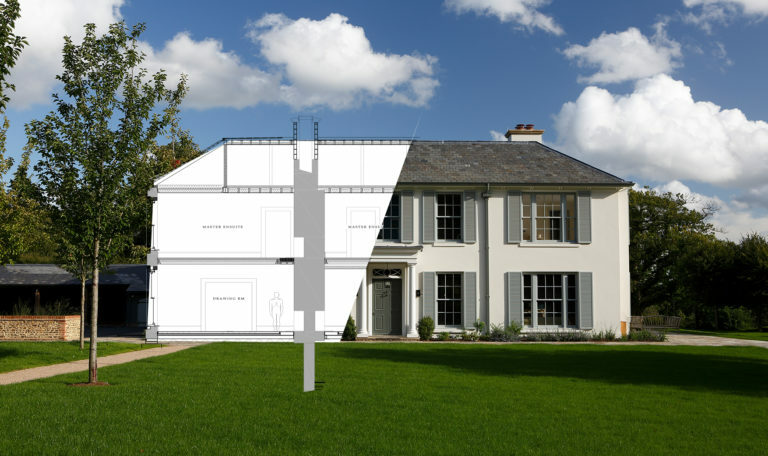 IS THE SCOPE OF THE WORK EXTENSIVE AND WILL IT REQUIRE PLANNING OR LISTED BUILDING APPROVAL? • If ‘yes’ contact a reputable architect, the RIBA (Royal Institute of British Architects, http://www.architecture.com/UseAnArchitect/Home.aspx) have a list of members and the types of project they specialise in. Research carefully, take up references from previous clients and where possible, see some projects of a similar nature to the one you wish to undertake. • The right architect will be able to guide you through the myriad of hurdles, such as planning consent, listed building consent, building control approval, etc. • Do you require the input of a Structural Engineer? Your architect should be able to advise you and make a recommendation. 3. DO YOU REQUIRE PROFESSIONAL COSTS ADVICE? • If yes, contact a reputable Quantity Surveyor, the RICS (Royal institute of Chartered Surveyors, http://www.rics.org/ukandireland) have a list of members and the sectors they specialise within. Your architect may also be able to provide a recommendation. • Consider budgets carefully, ensure a suitable contingency is allowed, 10% is reasonable. • Consider VAT, new build residential work is generally zero rated, conversion of multiple dwelling to single dwelling or refurbishment of buildings that have been uninhabited in excess of 2 years can be reduced rated, most other works attract full VAT. Energy saving materials and improvements can, in some instances, be reduced rated. HMRC provide excellent advice within Guidance note 708. Reduced rating of alterations under listed building consent no longer applies and was removed in March 2012. • Planning, Listed Building Approval and discharge of conditions. Your architect should be able to undertake these operations for you, however it can be a slow process and requires patience. Other similar consent issues relate to Tree Protection Orders, Highways Agency approval, English Heritage, Natural England, Environment Agency etc. • Bat mitigation works are a common problem and a significant number of Councils will insist on a bat survey prior to work being undertaken. Should bat mitigation works be required, a license will be needed and works undertaken at specific times of the year. Do not underestimate the legislation covering bats and other wildlife, they can stop a job proceeding until conditions are met. • Statutory Authorities. Should new incoming supplies be required, start this process as early as possible. Some network infrastructure providers can take months, and on complex infrastructure requirements it is not uncommon for electrical infrastructure to take in excess of 12 months to obtain, Wayleave agreements can become very complex and onerous. • Licenses for treatment plant discharge, Environmental Agency consents. • Asbestos. Any project where demolition is required must have a full asbestos survey. This must be undertaken prior to the construction phase so that the contractor can be made aware of the asbestos risks. • Irrespective of size or value of the project, you must always notify your insurer before you commence building work. Some insurers remove cover if building work is being undertaken or they are not notified. • As a building or property owner it is your responsibility to retain ‘building structure’ and ‘contents’ insurance during the course of any building work. Some construction contracts (JCT) have specific clauses detailing insurance requirements; standard clauses on refurbishment or alterations often state that the employer must take out a joint names policy to insure the ‘building structure’ and ‘all risks’ relating to the construction project. This can be expensive and difficult to obtain, do not leave it until the contractor is about to start on site to put insurances in place. Quite often the contractors insurance broker can assist on your behalf in obtaining the right cover for you, speak with your contractor early on in the process to identify the right approach. • Health & Safety: Any competent contractor will have good sound processes in place and will deal with these issues as an integral part of their service. Do not dismiss these factors as irrelevant, they need due consideration and to a small degree you need to accept some cost will be involved in implementing a safe system of work and to comply with statutory legislation. • Environment: With increasing demands on the environment legislation is tightening on all aspects of environmental control, whether relating to pollution, waste management, heat loss or carbon emissions projects need to be considered with these factors in mind. A competent contractor should assess these issues and alert you to matters likely to affect your project. • Construction Design and Management (CDM) regulations: Current legislation states that if you are undertaking construction work which will last more than 30 days or equate to more than 500 man hours your project will require registering with the Health and Safety Executive and falls under the CDM Regulations. The regulations state however that if the project is for a domestic client working on a residential property the regulations do not apply. If however these strict conditions are not met then you, as the client, will need to appoint a CDM Coordinator (CDMC) to act on your behalf in ensuring the health and safety of the project is coordinated from the outset of the project with your architect and design team. a) money spent on well installed good quality insulation and draught proofing is the best way to reduce energy bills. b) Capital outlay on renewable energy sources and air handling should always be your second consideration having insulated and draught proofed your property to the highest level possible. Having cheap renewable energy is great, but fundamentally a complete waste if the energy leaks out of your building as fast as you put it in. c) Consider insulation and renewable energy sources and air handling as an integral part of the scheme at planning stage, don’t leave it until the end when it is too late to integrate its installation. • When selecting your contractor, carry out sufficient research. Only appoint a contractor who has experience in undertaking the type of work you wish to carry out. Take up references and visit projects that are under construction; you can identify the efficiency of a contractor by the way the site is run. • Selecting contractors solely on price can prove short-sighted. It is often thought that obtaining the lowest price is the cheapest option, it is not. Contractors on a tight price and low margins will look to recover costs in other ways by shortcutting the process and quality, using cheaper subcontractors and by reducing management on a project. • Select a contractor whose team you think you can work with. If you intend having any personal involvement with the project, working with a team you do not gel with can become very irritating. The site manager is key in any project and is likely to be the individual you will have most contact with. • Avoid rushing into commencing a project, a degree of patience before starting a project can pay dividends in pre-start organisation and overall time taken to complete the project. The more organised the team the greater the opportunity there is of predicting costs and managing expenditure. Finally, enjoy the process, building projects can be milestones in your life and it is a shame not to benefit from the experience.